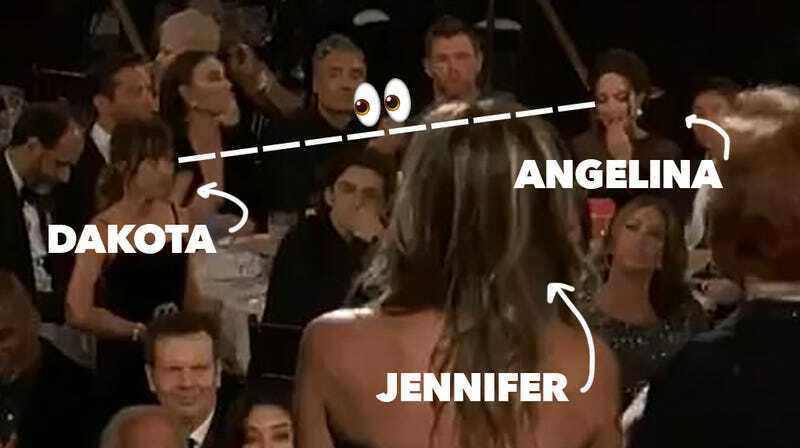 While doing her least favorite activity in the world (promoting a movie in the Fifty Shades series), Dakota Johnson was asked about the viral screencap in which she can be seen slyly looking at Angelina Jolie during Jennifer Aniston and Carol Burnett’s presentation at the Golden Globes. The image made the rounds earlier this month in a very, “Yaaaaas, Queen Dakota Johnson is one of us!!!! She lives for the Angie/Jen dramaaaaaaaa!” manner. The thing is, though...apparently she doesn’t. I’m not sure I buy this story, but I am sure of one other thing: that she definitely wasn’t staring at Jamie Dornan. This week’s People cover is all about Meghan Markle and Duchess Kate’s [allegedly] blossoming friendship. Most of the quotes from anonymous insiders are run-of-the-mill stuff, but I found this one, from a royal biographer named Ingrid Seward, to be sort of great. Love a subtle and unnecessary royal drag!